Book lovers unite on Goodreads – Cats, Chocolate + Commas. Goodreads is a social networking and cataloging site for book lovers founded in 2006 by Otis Chandler. Avid readers, authors and publishers can connect on this platform to see what others are reading, keep track of what they have read, are reading and want to read, and read book reviews. The site also has a recommendation engine that analyzes “20 billion data points to give suggestions tailored to your literary tastes.” Although not necessarily industry-specific because anyone can be a book lover, there are groups for authors, each genre, librarians and publishers as well as by location and subject. The majority of users are females 18 to 34 years old (Quantcast). I joined the site in 2012 and I’m not as active as I’d like to be, but I usually check it to see what others have said about a book before I read it — yet that probably won’t stop me from reading it anyway. Users simply make an account and can start sharing their recommendations, rating books, writing reviews, updating their reading list and interacting with others. Some other features include the daily quote, Never-Ending Book Quiz, giveaways, daily poll, 2015 Reading Challenge and Goodreads Choice Awards (Narula, 2014). Forbes has called Goodreads the “most important book networking site on the Internet.” It has the most users out of all book-related networking sites with 300 million members, 900 million books and 34 million reviews (Goodreads). This is the place to be for bookworms searching for the next best book. It’s also good practice if you ever want to be a reviewer too! Similar sites include Shelfari, LibraryThing and aNobii. Shelfari was acquired by Amazon in 2008 and Goodreads was acquired by Amazon in 2013. There is also a free Goodreads app, which allows users to access the platform from their phones. According to Quantcast, a company that specializes in audience analytics, the site had more unique mobile visitors than online visitors last month. However, more page views came from online. Alexa ranks Goodreads as the 124th most popular site in the U.S.
Goodreads is very popular for a specialized social network and in part, I think this can be attributed to it being connected to Facebook. It stands out from the major channels because it is a place where people who love books can share their favorites and authors can get discovered. The Goodreads blog is also a great resource for authors and publishers. 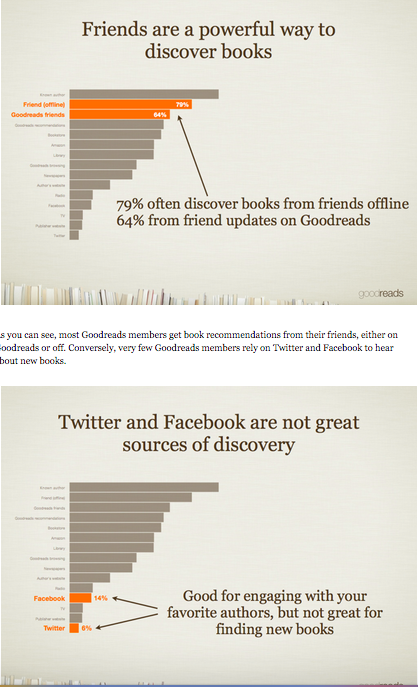 One interesting post I stumbled upon was about how books get discovered: According to the post, most people discover books from word of mouth and Goodreads friends, not Facebook or Twitter (Brown, 2012). An article in The Atlantic in 2012 said, “For now, Goodreads is basically Facebook with books, but if enough contributors set the bar high with creative, funny, and smart reviews it might become a force of its own” (Fay, 2012). To me, Goodreads is not only Facebook with books, but also a resource people use to see what others have said about them and make connections with others who share the same interest. 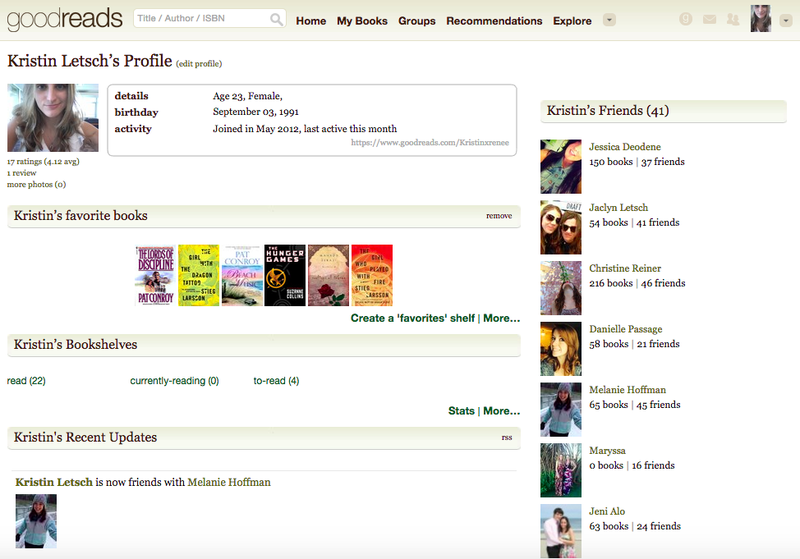 Goodreads has come a long way since it was created eight years ago in terms of capabilities and uses. The founder said, “Goodreads facilitates unlikely friendships, the rise of literary microgenres, and ‘deeper’ reading experiences across multiple platforms” (Narula, 2014). Going off of the first point, Goodreads is a content community where book lovers come together. I do know most of my connections because they found my account from my Facebook, but the site seems to be a way for strangers to connect and talk about their shared interest(s), which came as a surprise to the founder. In an interview, Chandler said, “We didn’t fully anticipate the strength of the communities that cropped up, where people were friending not just people they knew in real life but people they had been meeting on the site. And they were writing reviews. The reviews are hands down the most amazing thing of Goodreads; some people are just writing amazing, poignant, deep, funny reviews of books and sharing them with the wider community” (Narula, 2014). The publishing industry has been struggling the last several years after the introduction of the Internet, which has made way for self-publishing and ebooks. Thousands of bookstores have closed around the country since 2004. Statista estimates that by 2018 only about 22,500 bookstores will remain whereas in 2004 there were about 38,500. 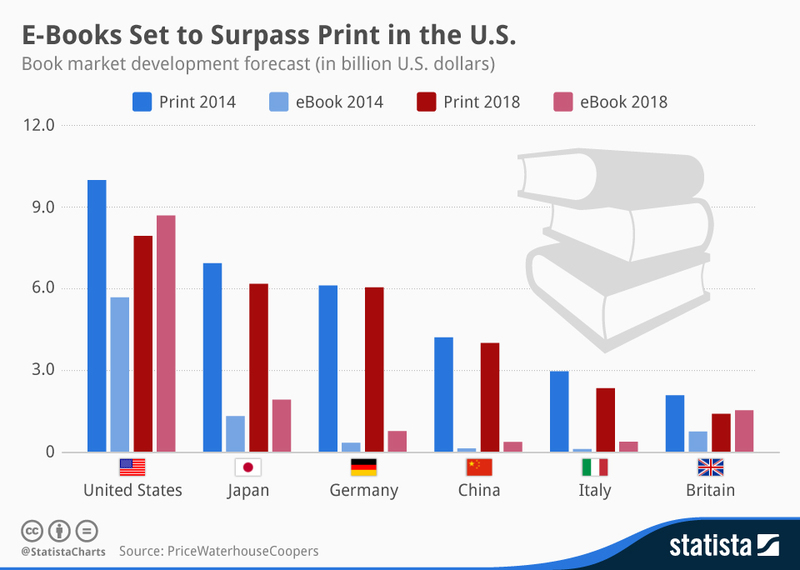 As the chart below shows, in the U.S. and UK, there will be more ebooks than print books in 2018. With this being said, perhaps proximity marketing could save the bookstores that do still exist, whether it’s Barnes & Noble or independently owned. Barnes & Noble has a membership program that offers free express shipping, 40 percent off hardcovers, 10 percent off almost everything else and a discount on its NOOK. However, it is $25 a year, which is probably a turnoff for most people. Members who either come to the store or are in the area could receive notifications telling them what’s new or about other offers. Notifications could also be pushed out to other consumers to entice them to come in and make a purchase. Independent bookstores can do the same. Proximity marketing might be able to keep bookstores and in turn publishing companies alive, along with the other marketing tactics they employ. Users can share whatever posts they make and activities they do on Goodreads on Facebook; therefore, Facebook is the most obvious channel that would complement the book site. Other social media — such as Twitter, Instagram and Pinterest — would be good platforms too. I think email would be another channel that works well alongside Goodreads. If a company is trying to promote a book and its been received well by others, it could link to Goodreads reviews so potential consumers can read what others are saying about it or to the author’s page on the site.